To thrive in the twenty-first century, can we learn to steer evolution? « Nothing in Biology Makes Sense! Anyone who follows the news knows how evolutionary change can cause trouble—almost all of them involve living things evolving to evade the ways we try to control them. Bacteria that can resist every antibiotic we use are the headline case. There are also dozens of agricultural weed species that shrug off widely-used herbicides, and insects like bedbugs and mosquitoes that survive most of the pesticides that are safe to use in human residences. As Carroll et al. note, all of these are the expected results of exposing large pest and parasite populations to strong selection, and we really can’t call them surprising. Alexander Fleming, the discoverer of penicillin, famously warned about the evolution of resistant bacteria—which was seen within years of the antibiotic’s earliest use—in his speech accepting the 1945 Nobel Prize in medicine. But similar principles apply in some less obvious situations, too. Cancer cells under attack by chemotherapy can evolve resistance to the drugs. If a large enough portion of a population isn’t vaccinated, or is vaccinated too late in the course of an viral epidemic’s spread, the virus may evolve to evade the vaccine-induced immune responses. Even wild fish have evolved to reproduce at a younger age, and a smaller body size, after generations of fishermen throwing back the ones too small to sell. Carroll and his coauthors note that evolutionary theory suggests how to stop unwanted evolutionary change: stop selecting for the traits we don’t want. That’s a glib summary of strategies that are really more like “stop selecting everywhere,” or “stop selecting all the time.” For example, rotating crops, and pesticide use, from year to year can prevent the evolution of resistant pests by reducing the advantage that comes of being resistant; so can setting aside a “refuge,” field where no pesticide is applied. Similarly, restricting the use of antibiotics to medical applications, rather than using them to promote the growth of livestock, can reduce selection for resistance; and marine refuges may help shelter fish populations from selection imposed by fishermen. Alternatively, we can try to design combinations of drugs or pesticides that create evolutionary conundrums, where individuals resistant to one chemical are more vulnerable to the other. That’s part of the logic behind “drug cocktails” used to treat HIV infection. But it’s worth noting that mutation and selection are good at solving puzzles. The flip-side of unwanted evolution is cases when we’d really like living things to be able to adapt, but they don’t. Carroll et al. note that one of the prime examples is visible in the nearest mirror: over-specific fad diets aside, it’s unmistakable that modern lifestyles give us access to a lot more calories, and let us be a lot less active, than is appropriate for the tuning of human metabolism. We’ve evolved in response to our dietary choices before, and we may very well still be evolving—but in the meantime, a lot of people have heart disease. Meanwhile, the global climate is changing, and many species we care about may not be able to migrate, or adjust their life histories, to compensate. In these cases, Carroll and his coauthors say, evolution again suggests some solutions. One is to change the environment that makes people sick, or endangers ecosystems. Many times, this is easier said than done. Another is to use genetic studies to identify and transplant individuals from one part of a species’ range that may be better able to survive in another—Carroll et al. note that this is essentially already underway in forests being replanted for timber. Yet this kind of “assisted migration” won’t be a panacea. Even if we transplant individuals we know to be better suited to one environmental stress, like warmer temperatures, climate change involves more than changing climate. 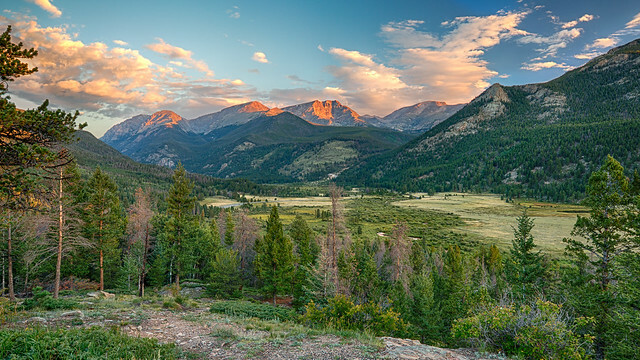 Right now, forests across western North America are being devastated by pine beetles, which are native, natural pests that have become much worse as winters grow less severe, and easier for the beetles to survive. Our ability to harness evolution is, plainly, limited by both our understanding of how living populations respond to natural selection and our understanding of what selection is acting on the populations we care about: crops, livestock, infectious bacteria, wild birds and mammals and insects, or Homo sapiens. As an evolutionary biologist, I’m all in favor of more research on exactly these topics! Reading this review article, though, I thought about another case of selection that I’d read about not so long ago, in cliff swallows. These swift, insect-eating birds build pot-shaped nests out of mud on cliff faces—and also on cliff-like human structures. 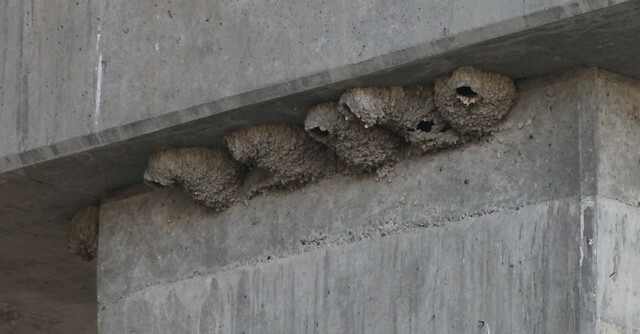 In particular, cliff swallows like to nest on highway bridges and overpasses, in big colonies. The birds hunt, if they can, close to where they nest, and chasing flying insects near a highway is a recipe for road kill. Yet, over 30 years of observing one such colony, the ornithologists Charles Brown and Mary Bomberger Brown saw that the number of dead cliff swallows they found on the highway decreased dramatically, even as the number of nests at the study site doubled. They compared the length of the wings of road-killed swallows to wing measurements taken on live swallows caught in mist nets, and saw that the dead birds consistently had longer wings. 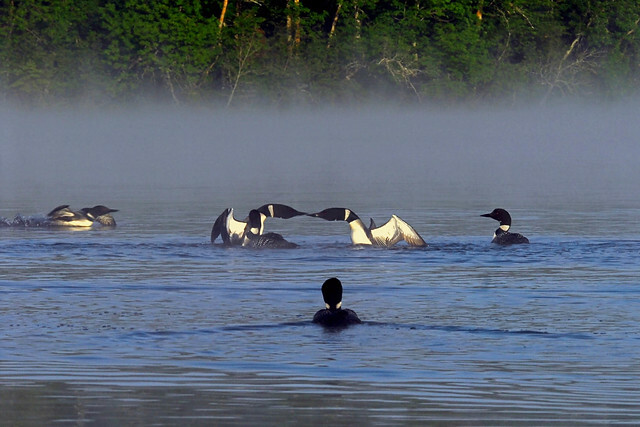 Over the 30-year study, the wings of live-caught birds grew shorter and shorter. Brown and Brown speculated that shorter wings make the birds more maneuverable, and better able to dodge oncoming traffic in pursuit of a meal. What I take from the case of the cliff swallows is this: human activity has changed, and is still changing, the biological world we inhabit in ways we’ll never notice. Thinking that we can entirely contain or stop the evolutionary change that we do notice is more Quixotic than Quixote, like trying to joust with forests and oceans. But I do think that with the kind of strategies Carroll et al. outline, we can stop worrying about the never-ending wave of evolutionary change, and learn instead how to surf it. Brown C.R. and M.B. Brown. 2013. Where has all the road kill gone?, Current Biology. 23(6) R233-R234. doi: 10.1016/j.cub.2013.02.023. Griggs D., O. Gaffney, J. Rockström, M.C. Öhman, P. Shyamsundar, W. Steffen, G. Glaser, N. Kanie and I. Noble. 2013. Policy: Sustainable development goals for people and planet, Nature, 495(7441) 305-307. doi: 10.1038/495305a. Carroll S.P., M. T. Kinnison, C. T. Bergstrom, R. F. Denison, P. Gluckman, T. B. Smith, S. Y. Strauss & B. E. Tabashnik. 2014. Applying evolutionary biology to address global challenges, Science. doi: 10.1126/science.1245993. Zhu F., H. Gujar, J.R. Gordon, K.F. Haynes, M.F. Potter and S.R. Palli. 2013. Bed bugs evolved unique adaptive strategy to resist pyrethroid insecticides. Science Reports. 3: 1456. doi: 10.1038/srep01456. This entry was posted in adaptation, big questions, conservation and tagged agriculture, antibiotic resistance, cliff swallow, pine beetle.